The beginning has past, yet still it lingers. You are in too deep. Life goes on without a specific person. 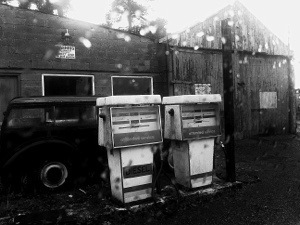 At a desolate petrol station. By a man unknown, a no one. As the car roared away, staying still. The silence lingers, the noise is remembered. The rain pours, a million drops of silver. Like eyes of orange honey dripping, spreading through the watery air. into the wet pinched globes rushing down. All showing the powers of the infinite nocturnal sky. To the music of the skies.